In July 2002 when I became the CASE Executive Director, I had so much to learn and to be real honest, I still have so much to learn! But don't we all? If we ever stop learning, then we really will stop having influence. With all the information coming at us these days it is less of a question of what to learn and more of when will we have time? Between personnel issues, new regulations, edits, and trends, and of course, putting out fires, when do we have time to "learn" something new AND implement it? One of the first things I learned was that CASE was a part of 2 of the IDEA partnerships — The Illiad (administrators) and Aspire (related service providers). About the time I think I figured out what these two were, the grant was changed. I was upset because I thought the IDEA Partnership was making great headway in pulling people together — we were finally talking across groups, at least within our group. Change is always hard. But, the IDEA Partnership truly "morphed" into what it needed to be — One group with many members instead of 4 groups with some partners. By having one group with everyone in the same group, we have really been talking to each other and collaborating with each other. The IDEA Partnership is just about to complete an amazing resource on the "Partnership Way." This resource will be an amazing tool for those who want to actually make a difference by engaging cross stakeholder groups. One of the benefits of the Partnership Way has been the actual output of some tremendous materials and tools. The Partnership for Assessment of Readiness for College and Careers, a 19-state consortium working together to create next generation assessments, additional sample items for both English language arts/literacy and mathematics. The sample items show how PARCC is developing tasks to measure the critical content and skills found in the Common Core State Standards. The sample items have undergone PARCC's rigorous review process to ensure quality and demonstrate the content that will be on the assessments in 2014-2015. Consider these facts. In 2009-2010: 1 in 5 secondary school students with disabilities was suspended (19.3 percent), nearly triple the rate of all students without disabilities (6.6 percent). 36 percent of all Black middle school males with disabilities were suspended one or more times. These — and other — alarming statistics outlined in a series of reports written by Daniel Losen and Tia Martinez at UCLA's Civil Rights Project originated from first-ever data collected by the U.S. Department of Education's Office of Civil Rights in its 2009-2010 civil rights data collection. Recently, the U.S. Department of Education’s Office of Special Education and Rehabilitative Services issued guidance to all public schools stating, instances of "bullying of students with disabilities that results in the student not receiving meaningful educational benefit constitutes a denial of a free appropriate public education under IDEA that must be remedied." What is the National Assessment of Educational Progress and how do students with disabilities fare? The National Assessment of Educational Progress — better known as the Nation's Report Card — is the largest nationally representative and continuing assessment of what America's students know and can do in various subject areas. Scientists have long known that children with high levels of toxic lead in their bloodstream are more likely than others to behave impulsively, have shorter attention spans and lower IQs and do poorly in school. Americans tend to be a vocal people, sharing their views about almost any issue in the public sphere loudly and frequently. 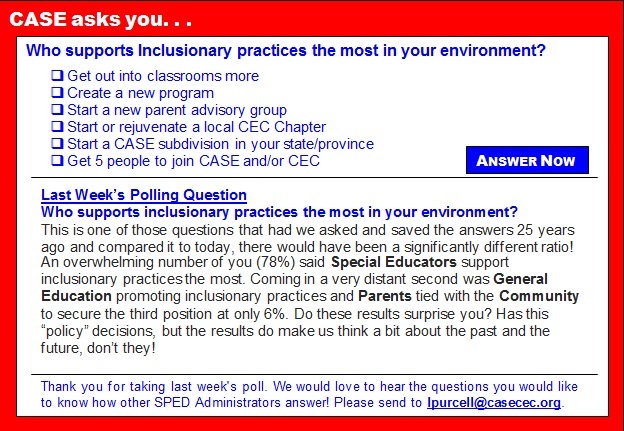 Yet on the question of how to provide special-education services to students who need them — while not compromising the interests of children who don't — many parents of regular-education students have opted out of any public discourse. Drs. Sally and Bennett Shaywitz, the co-directors of the Yale Center for Dyslexia and Creativity, based at Yale University, and longtime researchers of the reading disorder, have started a campaign to bring greater awareness of dyslexia to communities of color. The Multicultural Dyslexia Awareness Initiative had its first meeting earlier this month, honoring well-known people with dyslexia, such as actor and activist Harry Belafonte and author Victor Villaseñor. The initiative plans to hold more meetings across the country in coming months, Sally Shaywitz said in a conversation with Education Week. Too many children, she said, learn that they have dyslexia almost by accident, after years of struggling with school. Scientists have long known that children with high levels of toxic lead in their bloodstream are more likely than others to behave impulsively, have shorter attention spans and lower IQs and do poorly in school. Research out Tuesday finds that even children with just moderate levels of lead in their first three years of life are nearly three times as likely to be suspended from school by the time they're 9 or 10 as those whose blood-lead levels were below recent treatment thresholds. The study, appearing in the journal Environmental Research, analyzed medical and school discipline records of 3,763 children in Milwaukee Public Schools. Children with a history of asthma and various allergies may be at higher risk of developing ADHD (attention deficit hyperactivity disorder), according to a study published in the journal Annals of Allergy, Asthma and Immunology. Researchers from Boston and the Netherlands conducted a case-control study among boys from the UK General Practice Research Database. The study authors analyzed 884 boys with ADHD, and 3,536 boys without the disorder. As Secretary Duncan has noted, the Department of Education is committed to making sure that all of our young people grow up free of fear, violence and bullying. Bullying not only threatens a student's physical and emotional safety at school, but fosters a climate of fear and disrespect, creating conditions that negatively impact learning — undermining students' ability to achieve to their full potential. Unfortunately, we know that children with disabilities are disproportionately affected by bullying. Looking for similar articles? Search here, keyword BULLYING. The Common Core, a set of standards for kindergarten through high school that has been ardently supported by the Obama administration and many business leaders and state legislatures, is facing growing opposition from both the right and the left even before it has been properly introduced into classrooms. Tea Party conservatives, who reject the standards as an unwelcome edict from above, have called for them to be severely rolled back. Brain scans may help diagnose people with the common reading disorder dyslexia, a new study reveals. MRI scans in 40 kindergarten children revealed a link between poor pre-reading skills and the size of a structure that connects two language-processing areas in the brain, the researchers said. Previous studies have shown that this structure — called the arcuate fasciculus — is smaller and less organized in adults with poor reading skills than in those with normal reading ability. But it wasn't known if these differences caused reading problems or resulted from a lack of reading experience. Children who overestimate their popularity are less likely to be bullies than those who underestimate or hold more accurate assessments of their social standing, finds new research presented at the 108th Annual Meeting of the American Sociological Association. "The more kids overestimated their popularity, the less aggression they displayed," said Jennifer Watling Neal, an assistant professor of psychology at Michigan State University. Minority and low-income parents are more likely to see serious problems in their schools — from low expectations to bullying to out-of-date technology and textbooks — than those who are affluent or white, according to an Associated Press-NORC Center for Public Affairs Research Poll. Overall impressions of the nation's schools and teachers are similarly positive among all groups of parents, but deep demographic differences emerge in the details of how parents see teachers, schools and even their own roles in their children's education. A leading education firm is acknowledging that it messed up when evaluating alternative assessments for thousands of students with disabilities. Pearson said that there were errors affecting more than 4,400 students who were part of the Virginia Alternate Assessment Program, which offers alternative assessments for students with significant cognitive disabilities, the company said. Unlike traditional testing, the alternative assessments are designed to measure student progress by evaluating a portfolio of work completed over the course of the year. Educators are getting prepared to welcome students back to school this month. Many have spent the summer reading up on new teaching strategies or getting inspired by colleagues across the country. To help get those idea juices flowing, here are some MindShift articles that delve into creative work, tools and methodologies. Happy back to school.